We are a leading Exporter of metal saw manual machine, fully automatic metal cutting band saw machine, metal cutting band saw machine, degree metal cutting machine, high speed metal cutting band saw machine and metal band saw machine from Ahmedabad, India. 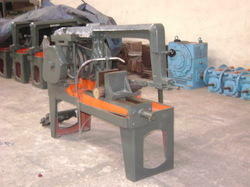 We are the manufacturer and exporter of Metal Saw Manual Machine. Size 7” 9” 10" 12"
Electric motor 1H.P. 1 H.P. 1 H.P. 1.5 H.P. Capacity of round bar 7" 9" 10" 12"
Capacity of square bar 5" 7" 8" 10"
We are the prominent manufacturer and supplier of Fully Automatic Metal Cutting Band Saw Machine. our organization provides a superior range of metal cutting band saw machine which is used in various industries for different applications. they are highly demanded in the market for their salient features like high functionality, efficiency, high performance and user friendly design. they consume less power and require low maintenance. 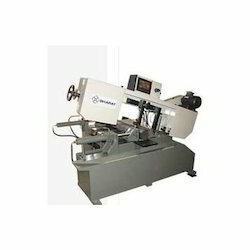 these machines are in-built with a sharp blade that is ideal for cutting metals very smoothly and without much effort. our ranges of these machines are also checked stringently by quality analysts to ensure that defect free range is supplied to our customers. 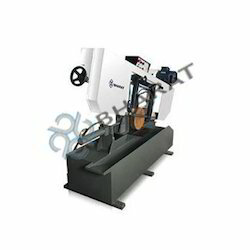 Providing for superior miter cutting capabilities, these Degree Metal Cutting Machine / Degree Band Saw Machine options are suitable to be used for light to medium duty applications. The system also features presence of band or circular saw blade that allows easy and more convenient cutting of structural steel and other metals as per the specific process requirements of the customers. Some of its advantages include providing for economical, low cost operations, available with automatic/semi – automatic/manual operating controls, supporting the demands of high repeatability and work accuracy, clamping & de-clamping support and standard accessories support of saw motor, coolant pump, V-Belt, job stopper & roller, hydraulic motor and others. Horizontal Metal Cutting Bandsaw Machines- Manual, Semi-automatic, Fully Automatic and Numerically Controlled Programmable versions (with Electro – Hydraulics / Electronic – Servo options) from 100 mm to 2000 mm cutting capacity. 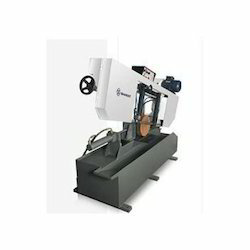 Providing for superior miter cutting capabilities, these Metal Band Saw Machine options are suitable to be used for light to medium duty applications. The system also features presence of band or circular saw blade that allows easy and more convenient cutting of structural steel and other metals as per the specific process requirements of the customers. Some of its advantages include providing for economical, low cost operations, available with automatic/semi – automatic/manual operating controls, supporting the demands of high repeatability and work accuracy, clamping & de-clamping support and standard accessories support of saw motor, coolant pump, V-Belt, job stopper & roller, hydraulic motor and others.